Bridging for me is simply straightforward here in Bridging we are NOT rewriting the Layer 3 packet simply forwarding the Layer 3 information in Layer 2 frame intact from one end to other. 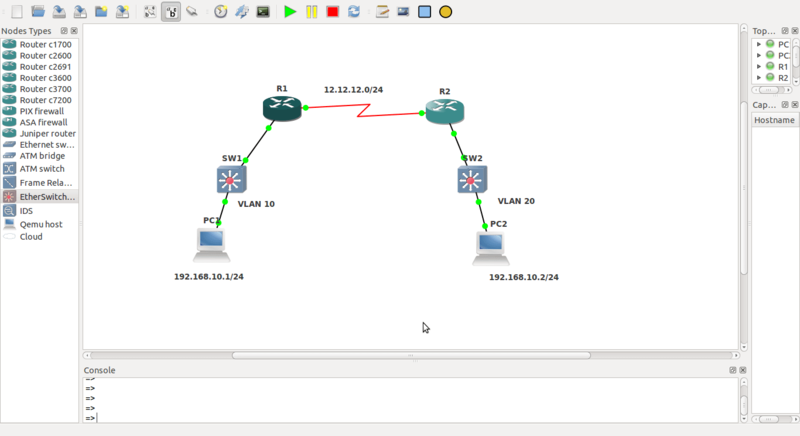 Today we are discussing Bridging same subnet over the WAN links , however i have taken the subnet in different VLANs just for fun to prove the reachability not depends on the local VLANs used in the LAN atmosphere. Here i have assigned 192.168.10.1/24 to PC-1 and this is in VLAN 10 , altogether the other side PC-2 ip add is 192.168.10.2/24 and this is in VLAN 20. We are using IRB (Integrated Routing and Bridging) for this.It mean we can Bridge and Route at the same time on the same interface. Then we assign appropriate interfaces into “bidge-group 1” on R1 and R2. Then we will create a Virtual BVI interface on R1 and R2 to talk to the routed Serial interface and assign the ip range used as default-gateway for PC-1 and PC-2. Other relevant configs are simple not any fancy stuffs used. We will wait for some time for MAC address learning purpose and issue the command ” show bridge 1 verbose ” on R1 and R2 , this is very helpful command in Bridging Scenarios. The configuration look healthy so far let us check the other side R2. Here also it looks we are learning MAC addresses from port FastEthernet 0/0 and Serial 0/0 , lets run our final verification command from PC-1 altogether over the WAN links crossing R1 and R2 over the other side PC-2. Indeed we are successful in Bridging LAN over the WAN.